The early Greek Orthodox immigrants came to Dayton, Ohio, individually, not as a group. It is hard to fully comprehend the faith, courage and strength of these young men who, with the blessings of their parents, left war torn Greek lands, came to America to forge a new life for their families. They were coming to a land strange to them and without knowing the language. Chris Politz came in 1880, followed by Thomas Caroompas, Charles Zonars in 1902, and Harry Chakeres in 1903. These young men wrote back home with the message that Dayton was a good and beautiful place with plenty of jobs. Mr. Caroompas brought his son Sam whose peanut stand, placed in front of the Dayton Courthouse on Second and Main, became a favorite stop for downtown business people. In 1900, Dayton, Ohio. had the 45th largest population in the nation and 33rd in highest wages paid. By 1910, there were more than 15 families. These immigrants found strength in the friendship they developed and faith they shared. As their numbers increased through additional immigrations, marriages and births, their religious needs were provided for by a monthly visit of itinerant mission Greek Orthodox priests who were assigned to Southern Ohio. These visiting priests were paid by individual donations. Moving on from early jobs of shining shoes and washing dishes, their natural intelligence and business skills developed. Their numbers grew and religious services were held in a space over the William Hanes Restaurant on South Ludlow. By 1921, there were over 65 families many of whom lived in the Robert Boulevard neighborhood. The area is now the campus of Sinclair College. Bound and determined to preserve and perpetuate their faith, language, customs, and traditions they turned their attention to establishing their own church. A fund drive amassed $5,000 so they were able to purchase an existing small church at 15 South Robert Boulevard. May 12, 1921 The Greek Orthodox Community was officially formed and a charter signed under the laws of the State of Ohio. Charter signers were: George Z. Lambesis, Spiros Pandely, George Steffens, Otto Zavakos and John Zonars. 1921 Father Germanos Papayioanous named the first full time priest. (A complete listing of priests serving the Annunciation parish is below.) The regular worship began at the Annunciation Church on Robert Boulevard. August 12, 1932 The local chapter of Philoptochos is founded. Penelope Zonars is appointed president. November 1932 The choir is organized. Daphne Thomas Zonars is named director and Angeline Make organist. 1934 The first Sunday School classes were organized and lead by John Zonars. Working with him were Xanthippi Floridis, Melpo Nickolas, Chrisoula Stamatakos and Helen Caras. December 1934 Families and business had flourished to the point that the community had outgrown its present location. The General Assembly voted to explore expanding or moving. A building committee was established. October 1945 The 1910 Keys mansion, sitting on 3 1/2 acres at 500 Belmonte Park North, was purchased with expense to the parish of $34,157.00. The purchase was accomplished mainly through the efforts of Louis Preonas, Apostolos Gelep, William Stoycos, Louis Zavakos, James Thomas, Harry Zonars and many others. The house served as a temporary church with classrooms and social center from 1945 to 1951. Dayton is an unusually community in that it has Wright Patterson Air Force Base and the Air Force Institute of Technology. During World War II, many engineers came to the Base, many of whom were Greek Orthodox. These people joined the parish and became involved adding professional expertise to the building programs and activities. In the later years, professors who came to teach at the Sinclair Community College, Wright State University and University of Dayton also added to the caliber of the community. 1945 Ground breaking for our present Church. Apostolos Gelep worked with the architectural company, the Alexander K. Eugene Bros, Inc., and oversaw the construction that cost $450,000. Extensive delays were encountered because of scarcity of materials due to WWII. June 26, 1949 The cornerstone ceremonies took place following the Divine Liturgy. September 9, 1951 Full time use of the undecorated edifice begins. Philoptochos commits to purchasing the pews and individual families donated different icons. 1951 The Dayton community was the first in Southern Ohio to establish a youth program now known as GOYA and YAL. 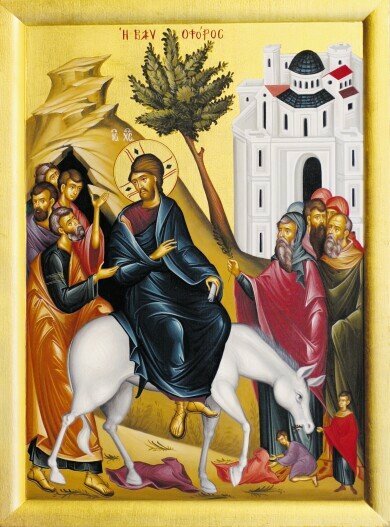 1995-56 Iconographer Stelios Maris, from Athens trained at Mt. Athos and residing in New York City, completes the icons in the interior or the Church. 1958 The annual parish picnic, held on the grounds in the red brick home, was expanded to invite guests and becomes our first Greek Festival. There were some years in the late 1960s that the Festival was not held then In 1973 the Festival was reinstated in the format that we know to this day. March 29, 1959 Kick off for the new community center. A fund drive was launched for a Three Phase Program for a new community center consisting of 13 classrooms, meeting rooms offices, a multipurpose ballroom with kitchen facilities. The records show number of children up to the age of 17 in the community was 400. June 6, 1961 The old red brick house known as the Keyes Mansion was razed to make room for the future Phase I and II. Paul Zonars was appointed chairman of the building committee and architects Brown, Head and Associates were chosen. They completed their work 5 months later. The Board of Trustees, a separate body from the Parish Council, were responsible for the finances. Phase III (the multipurpose room and kitchen) architect was Richard Levin and Associates. April 26, 1969 Completion of the third phase. The dream of a completed Church and Community Center was a reality. October 6, 1985 The Consecration of a church is the most significant event in its history. The word “engainia” literally means renewal thus the building is pledged and dedicated to Christian worship forever. The soul-stirring liturgy lead by His Eminence Archbishop Iakovos, assisted by Bishop Timothy and Fathers Dorozenski, Hiotis, Tasikas, Payiatis, Gigicos, and Nick remains as the high point in the life of this parish. James Morris chaired the weekend with the assistance of the priests, past presidents of the parish council, presidents of the various organizations and a most talented committee. 2010 The parish council has the talent members who can pursue new technology for updated communication with parishioners in and out of town. With the facilities in place, the community grew with worship, schools, programs and activities. Along with Sunday School, the Greek School for children grew to include an adult program. GOYA continues to sponsor very popular Metropolis wide Basketball tournaments. The parish has hosted Clergy Laity Conferences and the Choir has hosted MVGOX conventions. Philoptochos maintains a full lending library focusing on the Greek Orthodox faith. The St. John Chrysostom Oratorial contest has many participants as do the Metropolis summer camps. A fund is established to focus charitable donations, special education programs and on a scholarship program for students from this parish. The Greek Festival is now a major Dayton event and Philoptochos charitable works have touched people and agencies throughout the region, nationally and internationally. The grace of Christ our God gives us the will and energy to keep the faith and our community strong. As generations pray, enjoy fellowship and work together, the reigns of responsibility are passed from one to another all with the same goal, the dedication to Christian worship.